Metso will present its wide waste recycling equipment and service offering at IFAT China 2019 taking place in Shanghai New International Expo Centre, on April 15-17. Metso experts at the event will showcase the M&J pre-shredding and fine-shredding solutions backed with an extensive range of support services that enable customers to achieve their production targets with the most suitable solution and volume for various waste treatment processes. China has been strengthening its efforts to enhance environmental governance and the growing waste recycling industry calls for efficient and reliable solutions. "Our team of specialists is ready to discuss and share our knowledge about the various features of our reliable waste recycling solutions. We can help our customers to choose the most suitable equipment for different types of waste for optimal process efficiency, sustainability and reliability," says Ou Zeng, Sales Manager Waste Recycling, Metso in China. The comprehensive waste recycling product range, covering pre- and fine-shredding technologies, is supported by an extensive scope of service solutions from Metso. Metso has been strengthening its service presence in China to help our customers get more out of their assets. The most recent addition to the solution portfolio is the Metso Metrics digital solution, which is designed to provide waste recycling customers improved visibility and new insights into their equipment and processes with analytics, condition monitoring and predictive maintenance - all supported by expert services from Metso. Also launched recently are easy-to-use service tool packages each containing a complete set of components and tools needed for every shredder type. Customers can also benefit from our spare parts services to maximize value by having the right parts at the right time. In addition, Metso offers field service agreements that can be tailored to the customer's needs. With Metso's preventive maintenance services, the target is to improve the performance of the installed equipment. Metso's M&J pre-shredding technology for stationary and mobile plants is based on a powerful hydrostatic drive system, excellent knife design and an open cutting table. These features and other distinct technical advantages benefit customers who are looking for a robust high-capacity shredder for continuous use at a high run rate even with hard and abrasive materials. Metso's M&J fine-shredders handle a wide range of different materials and deliver very stable and homogenous output that is extremely suitable for Refuse Derived Fuel (RDF) production. 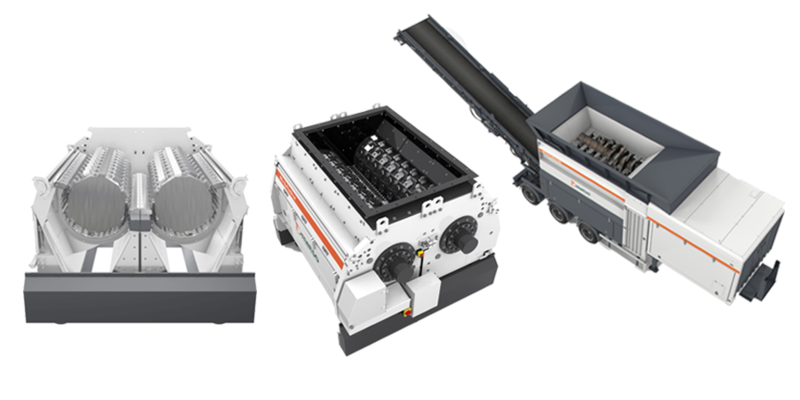 With Metso's fine-shredder, customers can achieve a throughput of up to 28 tons per hour, depending on the output size. The multi-edged shaft is fitted with a patented knife system and smart-engineering to reduce real-life operating costs.